Treat as biennial. 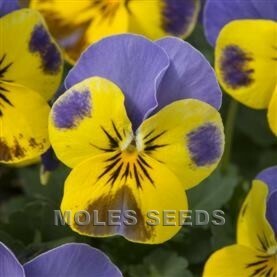 For technical details see Pansy. 750-1000 seeds per gram. Sell in: 6-packs, 8cm pots 1L pots 3 plants per pot. End Use: Containers, baskets, borders. Perennial, best sown October-February, 2-3 days at 12-15°C, then cold frame, 600 seeds per gram. Perennial, sow October-November, 2-3 days at 12-15oC then cold frame. 225 seeds per gram.